We are visiting old friends from university this weekend. 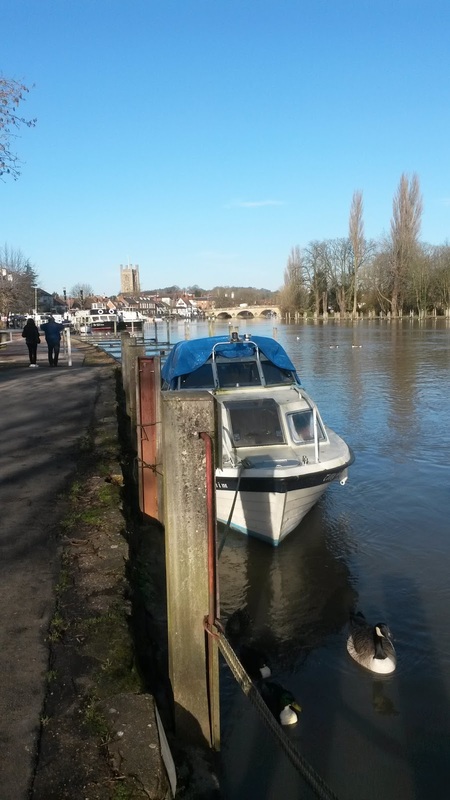 Their offspring are our godchildren and so I decided that I could allow myself a visit to Henley to stroll along the river and pop into the independent Bell Bookshop. Good advice is a given there, and I wanted books that the children might not have come across. I know a godparent's primary role is to be a faithful role model and pray, but I have added the need to teach them a lifelong love of novels too! Armed with an excellent excuse then, I managed to come home with six new books...only two of which were the said gifts! Onto book four: my latest read was an unusual one. Labelled as non-fiction, it is written in a literary style and tells the story of Sultan Khan's family in Kabul. The author, Asne Seierstad, spent four months living with them. Her timing coincided with the fall of the Taliban in Afghanistan and the American action to seek out Osama Bin Laden. This is not a political history however, it is a series of stories told by different family members, therefore creating a window onto complex social patterns and expectations. I am often surprised by the ability of stories to bring us closer to an understanding of one another. Through this book, I learned more about the lives of people in Afghanistan than I have ever gleaned from the news. Sultan Khan is the head of the family. He considers himself to be a liberalist and not a fundamentalist and he has stood by these principles. In the opening section of the book he quotes, "First the communists burnt my books, then the Mujahedeen looted and pillaged and finally the Taliban burnt them all over again." He was imprisoned for his livelihood, and yet he never closed his bookshops. He owned several in Kabul, each one run by one of his sons and overseen by his own steely authority. Liberal in his politics, Sultan Khan was not liberal in the home. His women feared him, and his sons were in awe. No-one disobeyed Sultan. He believed that Afghanistan had to recover from repeated lawlessness and the way to do this was to impose strict order in the home. His daughters enjoyed no freedom and his sons were expected to conform to his way of thinking, working and living. I was expecting the book to centre more on the bookselling and the difficulties of sustaining a business through the different regimes, but the shop, though significant and central to their financial security was not the most important element of the book. I enjoyed the stories of the women the most. Sharifa, Sultan's wife of many years, has to stand aside when Sultan takes a second, younger woman into his home. Leila is treated like a house elf in Harry Potter! She is expected to cook, clean, get up with the men and serve them food, clean their boots and provide hospitality when called for, and yet she remains in the background, hardly noticed. Her desire to teach is constantly undermined and she lives a life oppressed by intrinsic obedience to a system that renders her subservient. Marriage is seen as exciting and a way out of family drudgery, but it seems as though, in the main, the women swap their father's rule for that of their husband. The book does not judge,but recounts the experiences of a family who were kind enough to let the author live with them for an extended period. She was trusted and received many stories. Asne Seierstad brings Afghanistan to life, giving us a glimpse of religious ceremony, political uncertainty, police practices, poverty, wealth,expectations, morality and duty. It is the latter that resounded with me. For this is a story of duty and obedience rather than of love. Relationships are formed by negotiation and agreements rather than by romance and it is duty that provides the cement of loyalty. Despite its depiction of a culture very different from my own, humanity resonates throughout the book. People are people wherever in the world they live,think and pray. This is a story of life that sheds light on the complex politics of a complex country by empathising with a complex people. First I had to find a home for those new books! They are now installed on a newly created shelf (well the top of the existing bookshelf actually...and I have had to move the photo of the in-laws to make room) specifically for books not yet read. I added the four new titles and then scoured the room for other good intentions that have not yet been realised! I think my next novel will be Kazuo Ishiguro, Never Let Me Go. Please continue to read with me; as always, feel free to leave any comments or recommendations. Sounds fascinating - thanks again for a good read!